Intricately shaped pulses of light pave a speedway for the accelerated dynamics of quantum particles, enabling faster switching of a quantum bit. Credit: Peter Allen. From laptops to cellphones, today's technology advances through the ever-increasing speed at which electric charges are directed through circuits. Similarly, speeding up control over quantum states in atomic and nanoscale systems could lead to leaps for the emerging field of quantum technology. 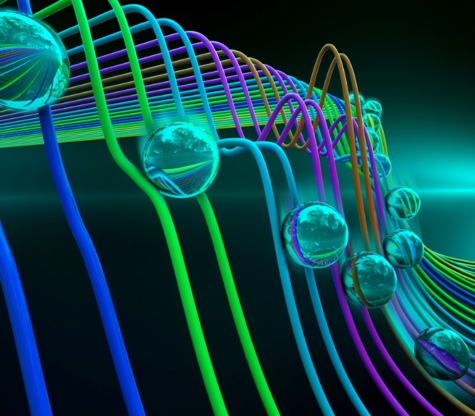 An international collaboration between physicists at the University of Chicago, Argonne National Laboratory, McGill University, and the University of Konstanz recently demonstrated a new framework for faster control of a quantum bit. First published online Nov. 28, 2016, in Nature Physics, their experiments on a single electron in a diamond chip could create quantum devices that are less to prone to errors when operated at high speeds. To understand their experiment, one can look to the ultimate setting for speed in classical dynamics: the oval racetracks at the Indianapolis or Daytona 500. To enable the racecars to navigate the turns at awesome speeds, the racetrack's pavement is "banked" by up to 30 degrees. A student in Newtonian mechanics could explain that this inward slope of the pavement allows the normal force provided by the road to help cancel the car's centrifugal acceleration, or its tendency to slide outward from the turn. The greater the speed, the greater the bank angle that is required. "The dynamics of quantum particles behave analogously," said Aashish Clerk, professor of theoretical physics at McGill University. "Although the equations of motion are different, to accurately change the state of a quantum particle at high speeds, you need to design the right track to impart the right forces." 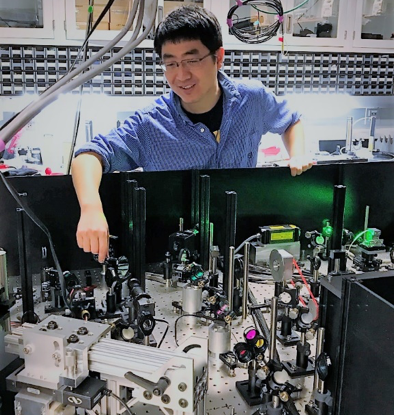 Brian Zhou, postdoctoral scholar at the University of Chicago, aligns the lasers onto the diamond chips used in the experiments. Credit: Awschalom Lab. Professor Guido Burkard and Adrian Auer from the University of Konstanz joined the Awschalom and Clerk groups to examine the data from the experiments. A leading expert in diamond-based quantum systems, Burkard remarked, "What is promising for translating these techniques beyond the laboratory is that they are effective even when the system is not perfectly isolated." A student of Newtonian Mechanics might also explain to you that centrifugal acceleration is a virtual force that exists only in a non inertial reference frame to account for the relative motion of the object and its tendency to move away from the axis of rotation.